The answer is strategy – but strategy redefined. Strategy that is imbued with action. Strategy that is adaptive. Strategy that connects your organisation to its realisation. How do you bring the all-important ‘Next’ into the ‘Now”? With all my talk of change as your most formidable competitor, it’s easy to see disruptive forces and the ever-increasing pace of change as the enemy that your business must defeat. But the real enemy of business evolution is not change, but how ‘now’ cripples your ability to focus on what’s ‘next’. It’s the multitude of forces, both life forces and our genetic predisposition, that keep us anchored in the present – the immediate and urgent – and prevents us from effectively focusing our thinking and activity on the future. http://jeffschwisow.com/wp-content/uploads/2018/05/Next-into-the-Now.jpg 1331 2000 Jeff Schwisow http://jeffschwisow.wpengine.com/wp-content/uploads/2016/02/Jeff_Schwisow_Logo-2.jpg Jeff Schwisow2018-05-23 07:00:462018-05-22 18:14:13How do you bring the all-important ‘Next’ into the ‘Now”? Strategic planning is easy, it’s strategic execution that’s hard! Let’s face it, strategic planning takes effort. It requires an investment of time, energy and reasonable capital, depending of the depth of market and competitor analysis included in your strategic planning efforts. However, once the retreats are over and the plans are developed and documented that’s when the really hard strategic work begins – the work of executing the strategy. It’s hard because one of the rarest elements of a strategic plan is a plan for implementing the plan – a strategy for executing the strategy. A structured means of giving your strategy-making forward momentum. 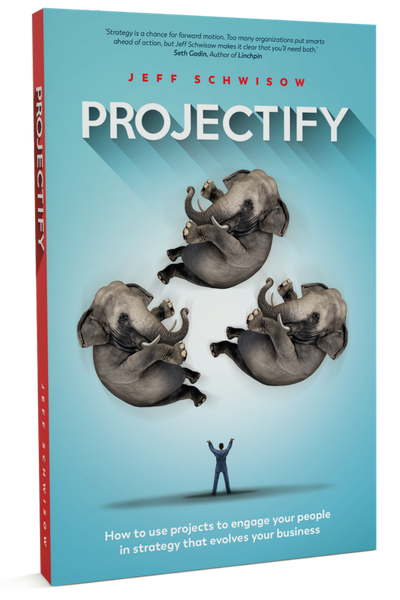 In this Projectify Point, I talk about the need to incorporate a framework into your strategic planning that turns strategic intent into consistent, persistent strategic activity – activity that generates meaningful strategic progress. When your strategy-making doesn’t engage your people, the business’s most valuable source of knowledge, capability and capacity is not being brought to bear on the important work of shaping your business for a desired future state. And it’s not being tapped to provide the signals that allow the business to understand where the brightest future might lie. In today’s fast-moving business world, that can be very expensive – or perhaps fatal – for your business. How are you giving your strategy life? What are you doing to create strategic forward momentum? How are you ensuring that your people are engaged in its realisation? I’d love to hear your thoughts and experiences in the comments below. http://jeffschwisow.com/wp-content/uploads/2018/05/Strategic-execution_hard.png 360 640 Jeff Schwisow http://jeffschwisow.wpengine.com/wp-content/uploads/2016/02/Jeff_Schwisow_Logo-2.jpg Jeff Schwisow2018-05-09 08:04:302018-05-10 17:57:36Strategic planning is easy, it’s strategic execution that’s hard! Does the nature of change in today’s environment have your business on the edge of a ‘tipping point’? As just about every current business book will tell you, the pace of change in today’s business environment is greater than it has ever been. However, this ever-increasing rate of change isn’t unique to the early 21st century. It’s been occurring for several decades. What is unique today is the nature of change – not just the speed of change but also how broadly and deeply change can impact your business. So, the danger for today’s businesses is that it’s ever-more likely that the pace of change will create a tipping point. A point where, once you’ve fallen behind, it is no longer possible to catch up. That crucial point where if you miss the wave, you can’t paddle fast enough to hop back on. In the last episode of my Projectify Points vlog, I talked about how change is your most formidable competitor. In this post, I want talk about how the nature of change has shifted to give it a ‘competitive edge’. How quickly does change enter your market or business? http://jeffschwisow.com/wp-content/uploads/2018/04/Diffusion-of-innovation.jpg 1333 2000 Jeff Schwisow http://jeffschwisow.wpengine.com/wp-content/uploads/2016/02/Jeff_Schwisow_Logo-2.jpg Jeff Schwisow2018-04-18 06:48:512018-04-18 13:25:21Does the nature of change in today’s environment have your business on the edge of a ‘tipping point’? In my last Projectify Point, I made the passing comment that, today, your greatest competitor is no longer the businesses that do the same things that you do – it’s ‘change’. In this episode, I want to dig into that idea a bit and how it relates to your strategy-making. In today’s environment, it is increasingly likely that your most formidable business challenges – as well as your greatest opportunities – won’t come from your traditional competitors. They’ll come from change – changes to the business landscape in which you operate. It’s your most formidable competition in the sense that change now moves with much greater speed and has the potential to create much more profound shifts than your traditional competitors ever could. How does this idea of ‘change’ being your greatest competitor sit with you? How might it effect your approach to strategy making? I’d love to hear your thoughts and experiences in the comments below. If you want strategy-making to help you to be more adaptive and evolve in today’s highly dynamic and uncertain business world…to better connect your people to a shared sense of purpose…then you need to understand what ‘strategy’ actually is. More importantly, what it should be if you are to shape the sort of business you hope to become. In the first episode of my Projectify Points vlog series, I share my perspective on how the aspirational nature of strategy should make it a perpetual journey into the future – one that has direction but no destination…no end point. The belief that a business is ‘either growing or dying’ has been entrenched in our strategic mindset since the mid-twentieth century. However, in today’s ever-more-dynamic business environment, organisations that are focused on adapting to change are the ones that thrive. These businesses believe that you’re ‘either evolving or risking extinction’.